There are many ways to amass an amazing baseball-memorabilia collection. One is to max out your credit card. Another is to attend countless Minor League games, where you can get up-and-coming players to autograph everything from photographs to game-used jerseys. That’s what Dave Bloomer did—counting the time he spent collecting baseball cards as a kid, he’s been at it for 40 years. In this interview, Bloomer, who is the Chief of Police in Hastings-on-Hudson, New York, discusses how he put together his extensive collection (it consumes most of his apartment and part of his parents’ house) and offers time-tested advice for budding collectors. Like most people my age, when I was growing up, baseball memorabilia meant baseball cards. The great thing about baseball cards at that time was that there was only one company, Topps, so not only could you collect, you also stood a good chance of getting all the cards that were available. Most people who have collections want to be able to see the light at the end of the tunnel. So, as an 8-year-old New York Yankees fan in 1970, the first thing I started collecting was baseball cards. I never threw any out and my mother never threw any out, unlike some of those horror stories you hear. Not only did I start collecting the cards from that year, I also started going back, collecting some of the older players. At that time, older cards weren’t really too expensive. I can’t tell you baseball cards are my number-one thing anymore, but I still get the Topps set every year, and I haven’t gotten rid of any of the cards I’ve collected. I started in 1970 and now it’s 2010, so you’re talking about 40 years of cards. I’ve also tried to complete most of the older sets, at least from the late ’50s on. I don’t worry that it’s a PSA 9 or whatever. Obviously, if you have two cards and one is in better condition than the other, I’m going to take the one in the better condition. But when I started collecting, people weren’t as concerned about condition; you just wanted to complete what you had. Collectors Weekly: When did you shift gears to autographs? Bloomer: Pretty much right away. In the mid-’70s, say ’72, ’73, ’74, ’75, I started writing away to Major League players and retired players and asking for autographs. At that time, nobody else was really doing that. I found that you could write a letter—you didn’t even have to include return postage—and players would answer you, autograph stuff, and send it back. As I look back on some of the guys that I was able to get, I realize I’ve been really fortunate. I got autographs of a lot of Hall of Famers who are now dead, as well as a lot of current guys. I got a Frank Robinson autograph that way. He’s not a fan-friendly guy, but he answered his fan mail at that time. Bob Gibson is also not considered a fan-friendly guy either, but he answered his fan mail back then. There weren’t computers so I wrote everything by hand. I’d say I would get an autograph back on about 80 percent of the mail I sent out. Somewhere in the ’80s I became an autographed ball collector. Again, I was fortunate to get a lot of guys before they passed away. Bill Dickey comes to mind, and obviously Mantle and DiMaggio. In those days, you could go to a show and get a Mickey Mantle autograph for $5 or $7. Nobody thought, “Boy, I better get 100 or 200 of these.” You’d go and get one thing and be very happy with it. The prices were not crazy. Now, almost anyone on the New York Yankees who is signing autographs will be expensive. I saw something recently where Francisco Cervelli was charging $60. The trick in collecting is to try and stay one step ahead of the pack, because when everyone catches up and starts doing the same thing, the prices get so high that it kind of defeats some of the fun in it. So I moved from autographed baseballs to game-used jerseys. 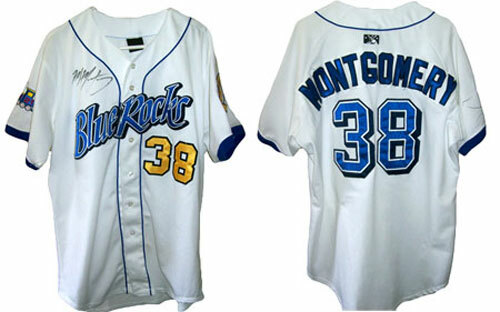 Top: Mike Montgomery wore this jersey in his home games playing for the Wilmington Blue Rocks in 2009. Above: New York Yankees star second baseman Robinson Cano is one of the players Bloomer has gotten to know in pursuit of his collection. In the 1990s, the Yankees used to have a fan fest at the Javits Center every spring. You could buy a game-used Yankee jersey from the previous season’s team for $500 or $600. Before the mid ’90s, you could get the best player’s jersey, which would’ve been Don Mattingly at that time, for $1,000 or even a little less. So I started collecting game-used jerseys, but then a lot of people started doing the same thing, so I began collecting Minor League game-used jerseys. Nobody was doing that. 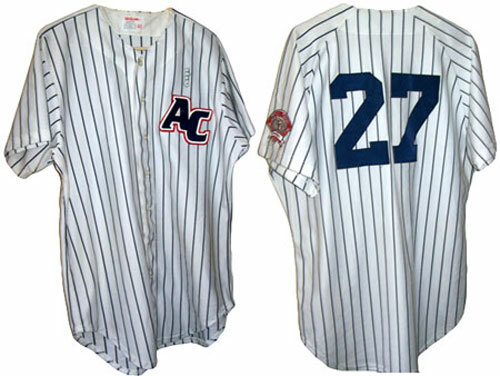 I bought a Derek Jeter game-used jersey from Albany (the Yankees Double-A affiliate at the time) in 1994 for $70. I’ve gotten offers of $10,000 for it. Now, people have caught up to the game-used jerseys in the Minor Leagues. What I enjoy doing now is going Minor League games up and down the East Coast and taking pictures of guys before they get moved up. Later I’ll get those pictures signed. Then if a guy becomes a decent player, Robinson Cano or Brett Gardner, for example, that picture graces the walls of my office. Collectors Weekly: How vast is your collection? Bloomer: It’s vast. It takes up most of my two-bedroom apartment. It takes up a storage unit. It takes up the basement and attic of my parents’ house. I’ve never gotten rid of anything. So no matter what I move on to or move away from in terms of collecting, I still keep everything. Over 40 years, you’re going to collect a lot of stuff, particularly if you’re a Yankee fan because there’s always Yankee memorabilia out there and so many collectible players, especially that Core Four (Derek Jeter, Mariano Rivera, Andy Pettitte, and Jorge Posada). Collectors Weekly: What is it about getting a players’ autograph as opposed to just buying it that you like? Bloomer: Well, every autograph that I’ve gotten, at the Minor League games particularly, I can recall the circumstances that led that guy to sign. Was he friendly? Did he ask questions? Did he like the picture that I took? Did he ask for copies of the picture? I found that you could write a letter and players would autograph stuff and send it back. It also makes you have more of a rooting interest. If Justin Morneau was incredibly nice to you in New Britain (Minnesota Twins’ Double-A affiliate) on his way up and you’re watching a Twins game, naturally you’re going to root for him because he was nice to you at one point. I’m fortunate—there aren’t a lot of Minor League teams exactly where I live, but if I really make the effort, I can see several leagues that are nearby. So I can see almost every player that comes through. Collectors Weekly: How much easier is it to approach Minor League ballplayers than Major Leaguers? Bloomer: Well, you can’t even measure it. If I go to Yankee Stadium, I can’t approach a Major League ballplayer. I’ll never get within shouting distance. It’s not that they wouldn’t turn around if I could, but the few select people that can sit close enough to perhaps get somebody’s attention, well, that’s not me. In Trenton, which is the Yankees current Double-A affiliate, however, I have season tickets and I can sit in the first row, and as a guy walks by, I can say, “Hey, that was a great game you pitched last night.” And he’ll often stop and talk about the game that he threw or a play that was made in the game. So it’s immeasurable. There are 4,000 or 5,000 people in Trenton as compared to 45,000 people at Yankee Stadium. Still though, it is unbelievable compared to, say, just five years ago how many more people are at the Minor League games. I started going to them for autographs in the early ’90s, say, ’94. There might have been me, whoever I brought to the game with me, and two or three other people that would get autographs. Now, no matter who’s playing, there will be a line of people from the dugout to the foul pole trying to get autographs. 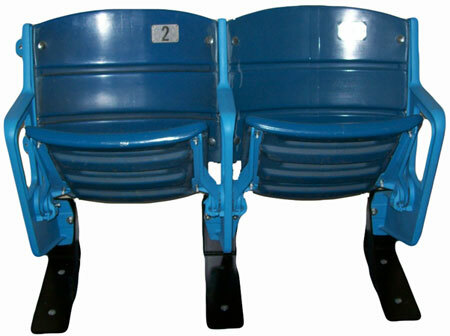 This pair of seats from the old Yankee Stadium resides in Bloomer’s office at the Hastings Police Station. Everyone knows who the top prospects are. There’s a site called Baseball America that has become a huge dispenser of information. The Internet makes it easy to get pictures of almost every player. All the teams now have team card sets, and Bowman or Topps make cards of guys before they even reach the majors. Unfortunately, some people think that everything that they get signed is going to put their kids through college. People are not just collecting for the pleasure of it but because they see dollar signs—they think everything that they get is going to be worth money down the road. Collectors Weekly: Do people resort to tricks to get autographs? Bloomer: I’ve seen little kids try to use the fact that they are little kids, talking in that sweet voice, to get players to give them batting gloves or cracked bats. I’ve seen that. You always hear stories, but I’ve never seen an adult pay a little kid to go get autographs. What I have seen are adults who utilize their own kids, especially if they know there’s going to be a big crowd because a top prospect is in town. For example, Redding just played in Trenton this past weekend, and that is a popular game because Redding is the Phillies’ Double-A affiliate and Trenton isn’t far from Philadelphia. There were parents who brought both of their teenage children with them so that they could each ask for something—six or eight things, usually—from one player to be signed. So I can’t say I’ve ever seen some guy walk up to a kid on the street and say, “Come on in here and help me get some autographs,” but I have seen adults use their own children in that regard. Collectors Weekly: How much traveling do you do in the pursuit of your collection? Bloomer: Well, I go to Trenton about 50 times a year. Trenton is 90 miles each way from my house, so that’s 180 miles round trip. I put probably somewhere in the area of 20,000 miles a year on my car. Guys probably never came into baseball not being fan-friendly. In the off-season months it doesn’t move, but during the season I’m driving to Wilmington (Kansas City Royals’ High-A affiliate), Trenton, Lakewood (Detroit Tigers’ High-A affiliate), Scranton (Yankees’ Triple-A affiliate), New Britain, and Binghamton (New York Mets’ Double-A affiliate). None of those places are particularly close to where I am. The nearest one is Trenton. New Britain’s a little farther than that, and Binghamton is about 170 miles each way. It adds up. I also go to Florida two or three times a year for spring training. I’ll go early to watch the Major League guys, and then I’ll go late to watch Minor Leaguers play. That’s still an unfound gem now in Florida. Nobody really goes to those Minor League games. Collectors Weekly: Is spring training a good venue to get autographs? Bloomer: Yes, but I don’t go before the games or during practices, which is when I understand there are still great opportunities for autographs. For the most part, when I go to spring training, I go to watch the Yankees, and that’s a totally different animal. I think it’s immensely easier to get autographs of players on almost any other team down in Florida or Arizona than the Yankees. In the 20 years that I’ve been going to spring training, things have changed quite a bit. For example, I have a videotape of me in Sarasota back in the ’90s, I guess, when the Orioles were there, calling Cal Ripken, Jr. over to where I was sitting behind the dugout. He came over and signed a bunch of stuff for me. One of my friends got it on videotape. No one else is rushing over and trampling me, and there aren’t 100 people standing within two feet of me. 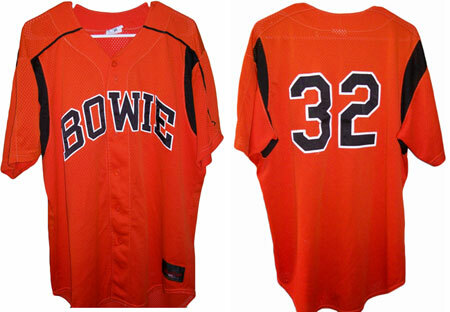 Bloomer owns this alternate Bowie Baysox jersey worn by one of baseball’s young stars, Matt Wieters. If the same thing happened today, Ripken would be swarmed and I’d be swarmed and pushed. And it wouldn’t have to be a Cal Ripken—it could be the fifth-string catcher on the Orioles, and everybody would be coming over and doing the same thing. So it certainly has changed. I don’t go to Florida for autographs. I go to Florida to watch the games, and because with the proximity to the field I can get some really nice pictures. Then, during the year, I try to get the pictures signed by the players. Collectors Weekly: What are some of your favorite interactions with players? Bloomer: My favorite interactions are with players you’ve probably never heard of. There was a pitcher who was a really high draft pick with the Tigers who got traded to the Mariners. His name was Cameron Smith, and he was playing in New Haven (former Seattle Mariners’ Double-A affiliate). I got very friendly with him, and he came down to Hastings, where I live, and stayed here with his wife. We went down to New York and watched the taping of “People’s Court.” He never reached the Major Leagues, but he was a heck of a nice guy and it was a nice friendship. I became friendly with an outfielder named John Darjean, who was a Minor League guy for the Yankees. He played for Oneonta, the former Yankees’ Short-Season-A affiliate. He came down and stayed here for a night because his mother was flying in at La Guardia and he had never been to New York City. It was easier than driving from Oneonta. With the bigger names, the guy who stands out, who was just incredibly nice and at the time always came over and recognized me is Mariano Rivera. He wouldn’t know me from a hole in the wall today, but when he was in the minor leagues he would always come over and say hello. When Robinson Cano was in the minor leagues, he, too, would always come over and say hello. When I’ve seen him periodically after that, in either spring training or when he was doing a rehab assignment, he’ll look over and say, “Trenton! Trenton!” like “I remember where I met you from.” To have somebody who has since met probably 10 million people remember who you are is pretty neat. Collectors Weekly: What are some of the really negative experiences you’ve had? Bloomer: Well, I would never mention anyone’s name because you don’t know what kind of day he might have had. I always look at it this way: Guys probably never came into baseball not being fan-friendly. I don’t think there are too many of those. Anyone who became unfriendly to fans had to have had a reason for it. Maybe some fan was rude to him or abused his privilege by asking for multiple autographs, and perhaps that turned him off to fans and collectors. The trick is to stay one step ahead of the pack. When everyone starts doing the same thing, it takes the fun out of it. It’s hard. If you’re a middle-aged man like me, a lot of players will look at you as if you must be a dealer or a collector. I’ve even heard players say—not to me, specifically—“I don’t want to see this on eBay tonight.” If players are feeling that way, they must have got that way somehow. They must’ve signed something someplace and then later that night seen it on eBay. I’m sure that must be very frustrating. They’re giving up some of their time in signing autographs, and somebody’s turning around and selling it that night. So a lot of times when I get my stuff signed at minor league games now, I have them put “To Dave, Best Wishes.” Now that probably lowers the value of it somewhere down the road, but I’m not looking to sell it. And if they see that you’re putting your own name on it, they know that you’re not a dealer. Collectors Weekly: How about the ones that got away? Bloomer: I can’t think of anyone off the top of my head that I have some big regret about. The great thing about going to Trenton or New Britain to get autographs is if you know what you’re doing and you know where you should be standing and you know what the guy looks like, you probably should do pretty well. Now, there are times when you’re going for a certain pitcher’s autograph, and if you don’t follow who’s pitching that night and your guy is the starting pitcher, well, you’re probably out of luck because a starting pitcher will normally not sign on the day he’s pitching. Bloomer happened to begin going to Minor League games right when the Yankees’ core four—Derek Jeter, Mariano Rivera, Andy Pettitte, and Jorge Posada—were coming through the minors. I can’t think of anybody off the top of my head that I specifically went for and didn’t eventually get. There have been players like Matt Wieters who I expended a lot of effort trying to get and finally did, but no strike outs. Okay, here’s a guy. I didn’t get Stephen Strasburg this year. He was a member of Harrisburg, the Washington Nationals’ Double-A affiliate, for a while at the beginning of the year. Harrisburg is in the Eastern League, which is a league I follow. Then he was in the International League with Syracuse, the Nationals’ Triple-A affiliate, which is another league I follow. From what I heard from collectors, it was a zoo at every game—they had to put security on him. When I was younger, maybe I would’ve fought harder for that and waited in all the crazy lines. But at this point, I don’t think anybody is worth that for me. Would I like a Stephen Strasburg autograph? Yes. At some point I’ll go to some Washington Nationals’ fan fest or card show or something and try to get him, but I just wasn’t going to fight it. He was up in New Britain this year as a visitor. I guess if I had expended a great amount of effort, I probably could’ve got him, but I didn’t. Collectors Weekly: You mentioned that when you were a kid, you used to write letters to players. Do you still do that today? Bloomer: Well, yes. I won’t do it during the season because they just get so much mail, but during spring training I’ll usually send out about 100 letters to guys that somehow I didn’t run across, maybe guys who played in the Texas or Pacific leagues that are nowhere near here. Back in the day, about 80 percent wrote back. Today, in a good year, I’m at maybe 35 or 40 percent, and that obviously includes return postage and me explaining why I’m collecting their autograph. The volume of mail players receive is just so crazy, and their time is limited. They’re only there for six weeks, so it’s not reasonable to expect that everybody’s going to answer you. But you do have some chance of success in spring training just because things are a little bit more laid back. Collectors Weekly: Do certain players have restrictions about what they’ll sign? Bloomer: Sure. 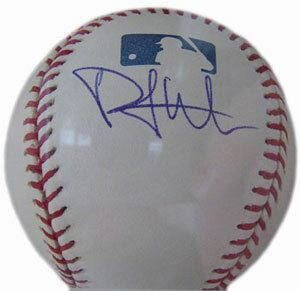 Sometimes guys have deals with companies preventing them from signing the sweet spot of a baseball. I remember when Phil Hughes was coming up through the minors, he was one of the nicer guys, he would always stop to sign, always pose for a picture. But if you wanted him to sign the sweet spot of a baseball, he wouldn’t do it. He would be really nice and explain that he has a deal with Steiner that says he can’t sign the sweet spot. I guess they were finding that a lot of balls signed in the sweet spot were showing up on eBay. So he would sign a baseball for you, just not in the sweet spot. There are other players that will only sign a certain brand of card. That’s because they have an exclusive deal with one company. I don’t collect Minor League cards for autographs, so I never have to worry about that. I take my own photos, which players are pretty willing to sign. It’s a 4-by-6 picture. You don’t see a lot of 4-by-6 pictures being resold, so they’re pretty willing to sign that. Collectors Weekly: Other than just buying jerseys at the end of the season, are there other ways that to get your hands on them? Bloomer: Not really. There are auctions. Grey Flannel is one company that has an auction a couple times a year. They have some terrific, old stuff. That’s kind of what I’m into now, the old flannels, particularly Yankee flannels which can go for several thousand dollars, even for an obscure player. Yankees’ pitcher Phil Hughes can’t sign autographs on the sweet spot of a baseball because of a memorabilia deal he has with Steiner Sports. Sometimes Minor League teams will have promotions in which the players wear special jerseys on a certain night, and then they will auction them off for charity. I think Trenton had a camouflage jersey promotion one night, a pink jersey, I think, for breast cancer another night. I’m more interested in something that a guy wore for the whole year or for half the year though. Those jerseys get auctioned at the end of the year. You can go to minorleague.com, where they post information about the upcoming auctions. Or you can wait for one of these auction houses to sell something. Lelands frequently puts some really neat items up for sale, but you pay a premium for that stuff because not only do you pay for the item, you also pay for the hammer fee and taxes. It gets to be quite expensive. One thing that I don’t have in my collection that I’m looking for is a game-used Brooklyn Dodgers jersey. I’ve bid in auctions for them a couple times, but they end up going for $7,000, $8,000, or $10,000. I drop out somewhere before that, but that’s one of my goals right now, to acquire something from Brooklyn when they played there. Collectors Weekly: When you buy the Minor League jerseys, do they come autographed? Right now I have a Carl Everett jersey. Carl Everett was a first-round pick back in the day, and he played for the Prince William Cannons, the former Yankees’ Low-A affiliate. At the end of the year I bought a bunch of jerseys from the Prince William Cannons, and his was one of them. I’ve never gotten it signed. He had a decent big-league career and now he’s playing in the Independent Leagues in the Atlantic League. If he was to ever see the size of this jersey compared to the size that he is now, I’m sure he’d be shocked that he ever fit in it. At some point in September, I’m going to try to look up his team’s schedule and get that jersey signed. Collectors Weekly: Have you seen a lot of changes in the designs and logos of Minor League teams? Bloomer: Well, Minor League teams are always changing logos and even names because they’re all about marketing. The crazier the name or the crazier the insignia, the more they sell. Minor League teams change that stuff constantly. For example, the San Francisco Giants’ Double-A affiliate used to be the Norwich Navigators, but they just moved to Richmond, where they became the Flying Squirrels. The crazy names are the ones that sell. Minor League teams constantly change their names, locations, and mascots. 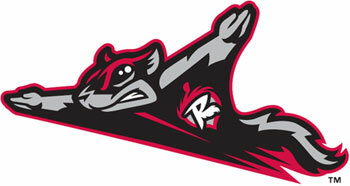 For example, the Flying Squirrel is the new mascot of the San Francisco Giants’ Double-A team in Richmond, Virginia. 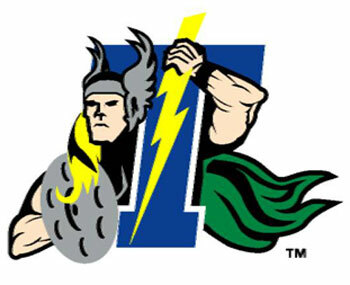 In the time I’ve watched The Yankees Double-A team, which is not that long, they’ve been the Albany-Colonie Yankees, the Norwich Navigators, and the Trenton Thunder. Their Triple-A team was the Columbus Clippers—it became the Scranton/Wilkes-Barre Yankees. The Low-A team went from the Prince William Cannons to the Greensboro Bats, and now they’re the Charleston River Dogs. So you could have multiple jerseys for a player if you were able to follow him up through the system. I’m not so crazy into the nutty names. I know the Minor League teams have to do that because it’s great for marketing, but for me, the Scranton/Wilkes-Barre Yankees is a better name than the Red Barons, their name when they were a Phillies’ team. Collectors Weekly: You said earlier that you don’t collect for investment, but how do you feel about the value of your collection? Bloomer: Well, you have to be delighted if the value of something you own increases. When somebody offers me $10,000 for my Jeter jersey, that’s great. Who doesn’t want their stuff to be more valuable? Having said that, the value of the stuff I have by Mark McGwire, Barry Bonds, and Roger Clemens has certainly fallen because of the steroid allegations. I’m no less glad to have them because I have no intention of selling them anyway. I remember my interaction with Mark McGwire. It was at spring training in Phoenix in the ’80s, and I remember getting him, Jose Canseco, and Dennis Eckersley on the same day. I remember him being very nice and friendly. If I had to pick one guy whose stuff I’d want, it’d be between Thurman Munson and Babe Ruth. Neither would come cheaply, though. So that’s more what I take out of my Mark McGwire autographed baseball, which at one point probably would have sold for well in excess of $1,000 and which now I probably couldn’t get much more than $100 for. Of course, I’d rather have it worth $1,000 than $100, but I don’t lose sleep over whether my stuff goes up or down because I’ve never sold one thing I’ve accumulated. My favorite item is the last item I got. Like I said, though, I think everybody would rather see their stuff be more valuable than less. If you own a house, even if you don’t intend to sell it, you don’t want to see it go down in value. You don’t want your stuff to be worthless, but I think the majority of people who collect autographs do it because they enjoy it and it’s for them. What I don’t understand are people who bring nine of the same cards to a game to be signed. Why would you possibly want nine of the same card signed? If you had nine different cards, I could understand that; maybe you’re completing different sets and you’re working on different projects, but nine of the same card? I think those people are not in it for their own enjoyment, and I’d bet that eight of those cards, if not all nine, are going to be sold somewhere down the line. Collectors Weekly: You say your favorite item is always the last one you got, but does your collection also have its crown jewels? Bloomer: Sure. I was really fortunate to have started collecting when Jeter was coming through the Minors. The first couple of years I collected, Derek Jeter, Mariano Rivera, and Andy Pettitte were all in Double-A and Triple-A. I have a game-used Tampa Yankees (the Yankees’ High-A affiliate) jersey of Mariano Rivera that he signed for me. I also have a jersey from Columbus when he played there that he signed. I have the Derek Jeter Albany jersey, plus a Pettitte Prince William jersey and a Pettitte Albany jersey, both game-used. I also have beautiful pictures of all of them—Pettitte, Posada, Jeter, and Rivera—as 18- and 19-year-old players. These pictures make them look younger than high school kids that are playing here in Hastings. Those pictures are in my office. When people come into my office, the pictures of Derek Jeter really get their attention. When they first look, they all think it’s some Hastings High School kid, but when they look closer, they’ll say, “Is that Derek Jeter?” He is incredibly young in the pictures. I was just lucky I started at that time. This is the jersey worn, and later autographed, by Derek Jeter when he played for the Albany-Colonie Yankees in 1994. Bloomer has received numerous offers for the jersey, but doesn’t intend to sell it. When the Yankees had a Class A team in Greensboro, I met Robinson Cano and bought his jersey at the end of the year. A couple years later he was signing at a Last Licks Ice Cream store as a Yankee. I brought that jersey to Last Licks. As I said, Robinson Cano is actually somebody who remembers me. He was very nice and signed the jersey. I said, “Well, this is something I collected.” I was sure I wasn’t going to want to trade it, but I took his number. We never spoke after that. I never really even considered it, but it was pretty neat that I had something that Robinson Cano and his family wanted to try to acquire. 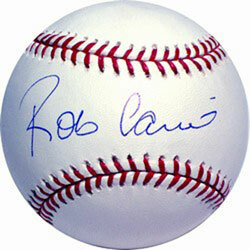 Collectors Weekly: You don’t get that with an autograph you purchased of, say, Mickey Mantle, right? Bloomer: Well, listen. Card shows have their place. I never begrudge anybody getting autographs at card shows—if I don’t want to pay the money, I don’t go. There are certain people that you’d never get another chance to meet unless you go to a card show. So I think card shows are great. If I really want somebody’s autograph, I have no problem paying for it. Last night I was watching a Royals game. Of the 18 starting guys on the two teams, I had some kind of a personal interaction with 14 of them. In the case of Mickey Mantle, I never would’ve gotten his autograph otherwise. I wasn’t around when he was a player. If you are a Yankees fan, one of the things that you want to have in your collection is a Mickey Mantle autographed baseball. Same goes for Joe DiMaggio. Having said that, I saw Phil Hughes have a dominant season in Trenton. I saw Joba Chamberlain have a dominant season in Trenton. I saw Ian Kennedy have a dominant season in Trenton. It hasn’t translated into big-league success for some of those guys, but to see them have those years, the stuff that you were able to get them to sign during that time is much more interesting and much more memorable than just going to a card show. Collectors Weekly: What are some of the cards you look for when you attend a show? Bloomer: One of my favorite sets is the ’55 Bowman, which are the TV-screen cards. For some reason, that’s a set that I always like, and there’s a number of great players, all famous, in that set. Mantle is in the set. Mays is in the set. Aaron is in the set. They’re the cards that are tougher to come by, at least in great condition. Believe it or not, there are umpires in that set. I’m sure if I had been collecting in 1955—I wasn’t born yet—umpires wouldn’t have been high on my list of collectibles, but those are some of the more desirable and tough-to-come-by cards today. So I haven’t gotten many of those. With Topps, I like the ’63 cards because I think they have good pictures on them. You can see the players really well. Some of those cards are the same guys, Mantle and Mays and whatnot, and are somewhat expensive to come by in great condition. Between card shows and the Internet, though, if you’re willing to spend the money, you can pretty much get whatever you want. Collectors Weekly: Would you say that your collection is skewed towards Yankees memorabilia? Bloomer: Well, my collection leans Yankee. It’s twofold. 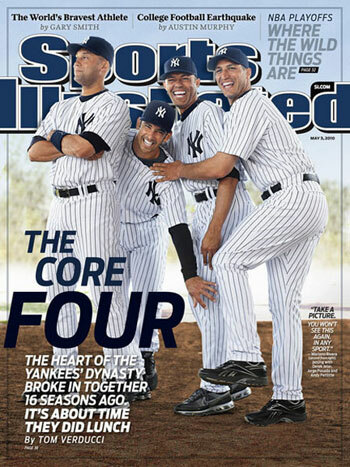 Number one, I’m a Yankee fan, and number two, they have had such a great history. They’re the only team that has Old-Timers’ Day because they have so many guys that they can bring back. Even the Mets don’t have Old-Timers’ Day. So none of the other teams really have the history or the personnel like the Yankees. 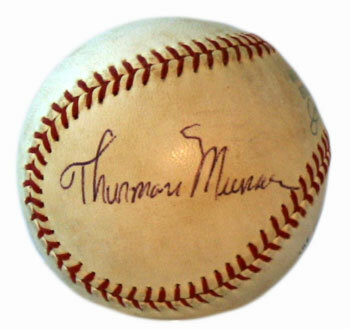 Thurman Munson’s tragic death made autographed baseballs of his rare. A Munson ball is one of the few missing pieces in Bloomer’s collection. The first couple of years that I collected, the mistake I made was only collecting Yankee stuff. So while I would be taking 10 different pictures of a guy named Jason Robertson who played for Albany, I probably missed Mark Grace and other guys that came through the Eastern League—the visitors. You asked about a guy who I wish I had gotten an autograph of? Believe it or not, I never got a Nomar Garciaparra autograph. He played in Trenton when Trenton was a Red Sox team. I probably saw him 10 times but I never went and asked for his autograph because I was always getting Yankee stuff. So in the mid-to-late-’90s, I figured out there were players on other teams I should be looking at and meeting and getting their stuff signed. I rectified that and now I make sure I do both the visitors and home team. Collectors Weekly: What would you say are some of your major wants right now? Bloomer: Somehow I missed getting Jason Giambi’s autograph. For all the Yankee teams of the ’90s, I try to get an individual ball signed by each guy. Giambi is a good signer in spring training, but somehow I’ve never been able to get him. I think he’s a really fan-friendly guy; it just never worked. Garciaparra is another guy. I’m a big American League fan. He’s a guy I always wanted to get. Of guys that are deceased, I would love to have a Thurman Munson signed ball. I have an index card that was signed by Munson that I received in the mail. He died in ’79. I’m sure he would’ve been right there at card shows after his retirement. He just passed away too soon. There was never an urgency about getting his autograph, and then all of a sudden he was gone. His stuff—his jerseys and bats are now quite valuable, and he was not a great, fan-friendly guy, so he didn’t sign a lot of autographs. Matter of fact, in one of my displays in one of my rooms, I have an autographed ball from everybody on the ’77 team. That was the first Yankees team I saw win a World Series. In the place where Munson’s ball should be is just a baseball card and an empty ball holder. If I had to pick one guy whose stuff I would want, it would be between Munson and Babe Ruth. Neither one of them will come cheaply, though. Collectors Weekly: How do you store and display your collection? Bloomer: I have a two-bedroom house, and the second bedroom is just a baseball-memorabilia room. I have literally dozens of boxes of signed baseballs. I don’t have them on display because the worst thing for a signed baseball is sunlight. You’re kind of damned if you do, damned if you don’t. If they’re away in boxes, they can’t be enjoyed, but if I put them out for display, sunlight will ruin them. When Robinson Cano was in the minor leagues, he would always come over and say hello. So I have about five display cases in that room, and each one has a different theme. There’s a Hall of Fame display case, which has autographed balls of Hall of Famers. There’s the ’77 Yankee team display case. Another one is just Yankee Hall of Famers that I have either statues or autographed balls of. All that stuff is in a baseball room, and it’s kept locked and there’s an alarm. I have tint on the windows, and the blinds are down so that the sun doesn’t hit that room. You have to be really careful. I’ve seen so much stuff fade over the years. I don’t want all the effort to secure the stuff in the first place to be undone by either sun or excess handling. My jerseys are kept in a nice display closet. It was a powder room for the previous owner of this apartment. That’s where some of the more valuable jerseys are kept. The stuff I keep in storage is stuff that I’m not too concerned about if something happens. Not that I want anything to happen to anything, but in storage I don’t have as much control over it. Same with the stuff at my mother’s house—that’s mostly where all the baseball cards are. They’re either in the plastic sheets or they’re still in the boxes unopened. Collectors Weekly: Other than crowds, how else has collecting changed since you started? Bloomer: Well, the Internet has been the biggest change. If you go on the Internet right now, you could probably find almost any card that you are interested in or an autograph of almost any player you want, if you’re willing to pay the price. The Internet also has a lot of information. That’s been the biggest change. Here’s a perfect example. When the Yankees had their team in Albany, you would never know how it was doing. How is Derek Jeter doing in Albany? You would never know unless you went to the game. So I used to subscribe to the Albany paper, the “Albany Times Union.” It would be delivered to my house two days later—you couldn’t get it the same day—and I would read a two- or three-day-old newspaper to follow the Albany-Colonie Yankees. Bloomer has season tickets for the Trenton Thunder, the Yankees’ Double-A affiliate. He gets many of his autographs at Trenton games. Now, I can get on the Internet and listen to every Trenton Thunder game live. I can watch every Scranton/Wilkes-Barre Yankees game. The technology is just so crazy. I’m sure if I wanted to follow the San Jose Giants (Giants’ High-A affiliate) online, I could listen to every pitch. Ten years ago, you couldn’t even read the next day to see how anybody did. You would have to, like I did, buy the paper from Albany and wait a couple days and see how they did. Today, everyone’s statistics are updated nightly. If you look at the box score, you know how Jesus Montero is hitting for Scranton. You know what Austin Romine is hitting for Trenton. You know what Gary Sanchez is hitting for the Gulf Coast Yankees, which is the lowest Minor League level. You can get online and read the newspapers from those towns every day. And not only can you look at the box score, you can read an article about the game the next day to see what you’ve missed that’s not in the box score. Collectors Weekly: What advice do you have for other collectors? Bloomer: When it comes to autographs, you’re asking somebody to do you a favor, so I’d say a couple of things. Number one, go prepared. You should know what a player looks like so that if he walks past you, either in the stadium or in the concourse or on the way into the stadium in his street clothes—which might be your best opportunity to get his autograph—you’ll recognize him. If you don’t know what he looks like and he walks right past you, you’ve blown it. Number two, always be polite. Anytime you’re asking someone to do something, you should be polite—use “please” and “thank you.” Players appreciate that more than anything. And number three, remember, they’re not obligated. I always look at it that way. No player has to come over and sign anything. You don’t know what kind of a day that guy has had. One of his parents could be sick, he could have a problem back home, or maybe he’s hurt and nobody knows about it. These guys are human. Once Ripken signed a bunch of stuff for me. If a fifth-string catcher on the Orioles did the same thing today, he’d be swarmed. So you should never be rude even if the player doesn’t sign that particular day because at some point you’re probably going to run into him again and you’ll have another opportunity. If you’re rude, you’re just going to turn him off to all collectors. We’ve seen players that end up turned off. In the minor leagues, Pete Rose, Jr., who was obviously not the player his father was, became really anti-collector. Maybe it was because of his father or maybe it was because of the experiences he had. You also need to decide what you like and stick to it. There’s so much stuff out there that it’s easy to expand your collection too much. Decide what you like. I like taking pictures and getting them autographed. In Trenton, I see a whole array of different things. There are people that go to those games and stand behind the outfield fence and collect batting practice or home run balls. They don’t go in to get stuff autographed. They just see how many baseballs they can collect. There is one collector who tries to get anyone who has played a Major League game with the Yankees—it could just be one pitch—to sign a baseball. So if Ray Burris, who is the pitching coach for Erie, the Tigers’ Double-A affiliate, and pitched for the Yankees in the ’70s, comes to town, he will try to get Ray Burris to sign a baseball. This year if he went to Scranton he’d do really well because Chad Moeller, Juan Miranda, Kevin Russo, Chad Huffman, Colin Curtis, Greg Golson have all played, plus a whole bunch of pitchers. So that’s a neat collection. There’s only one guy that’s doing that. There’s another guy who takes a bat and gets anyone who has played for Trenton this year to sign it. That’s all he does. He doesn’t come to get visitors. He doesn’t get multiple things signed. If a new guy comes up to Trenton, he brings the bat and he gets him to sign it. So I think you really have to decide what it is that you want to collect, what you want to go for, and stick to it. And you’ve got to be willing to put in the time. I would never expand my collection. I don’t do football. I don’t do hockey. I don’t do basketball. That’s simply because there’s just no room here. You spread yourself too thin, and you can’t really work on the one thing that you’re really collecting. Obviously, you might have to change a little bit. I went from baseballs to jerseys to photographs. But find what you like and stick with it. great article. thanks for a great insight on how to collect and do it tastefully. Years ago when the AC Yankees were still in Albany, my dad would take us and we’d always try to get our AC Yankees baseball signed. We had a bunch but I haven’t been able to find it. I don’t even know if Jeter or Rivera or anyone else even signed it but there’s that chance they did. Nice article,for info I would feed the team at my restuarant all the years that they where in Albany,have sigs,bats balls uni’s, pictures and whatever,plus the vermont team,reading phils,glens falls,oneonta tigers, and HOF fromCoopertown.Really enjoyed and have lasting frienships with alot of the players,by the way the article missed many other players that visited the team and I fed them also. this is a great article, on the last day of moving the albany-colonie yankees from heritage park they had all the moving vans lined up, loading equip and anything owned by the franchise. it was really sad to see them go since it provided many years of good family safe, fun. all those memories where the kids would line up at the fences for autographs and really just to meet the former major league hopefuls, just to get close. and of course their mascot “GROUNDER’ who would dance atop of the dugout, rallying the stands, race around the basepaths with kids (always letting the kids beat him to home) , and of course the give aways….on the last day I walked into the office and there is grounder laying on the floor still with those big eyes and laughing face ( you could tell he would miss all the kids) as i looked at him , i felt the compulsion to ask , “and what about grounder?” they said, “We dont know” “there doesnt seem to be room on the truck for a place that grounder wont fit in” so I said, “You mean Your cutting him from the roster?” they said “yup, thats part of the game” and of course, mynext question was, “how much” Today grounder sits in my office. “ ” Morris Chalfen was a genius. He realized ice shows needed no translation; that they would appeal to people all over the world.